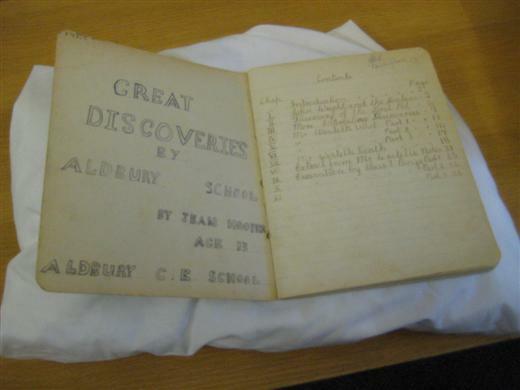 In early September 1943, during the Second World War, Miss G B K Harris, then Headmistress of the school at Aldbury, reported the finding of small fragments of pottery in the village to Percy Westall. He was the Curator of Letchworth Museum at the time. This material had been shown to her by a Mr Wright during a nature ramble by class IB Boys, who were trying to locate a special plant – the Great Henbane – on Mr Wright’s smallholding. Following the identification of the finds as ‘pre-Roman’, a fascinating series of events unfolded. The site, a rare cremation cemetery dating from the early 1st century A.D., was excavated by the school children, who remarkably kept a detailed record of their work, including written descriptions, scaled drawings of the site and their finds as a school project. Several of their exercise books have survived and these, together with other correspondence in the Letchworth and St Albans Museums and at County Hall, Hertford, have enabled the full story to be recorded. The finds consisted of at least six individual burial groups. Each group was buried in a separate pit and consisted of several pottery vessels. 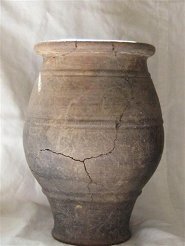 In each case, one served as a ‘burial urn’ and probably contained the cremated human bones. 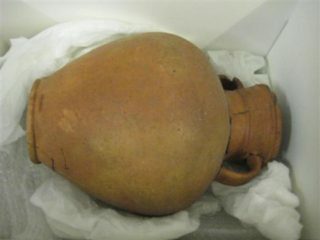 The others, known as ‘Accessory Vessels’, consisted of flagons, platters and drinking beakers. These almost certainly contained food and drink for the afterlife. Three decorated bronze ‘Colchester’ type brooches, very similar to large safety pins, were also recovered. The pottery itself seemed to be mainly of local manufacture, although some pieces were almost certainly ‘imported’ from outside the region. The burial ground, on current evidence, seems to date from the 1st half of the first century AD. Even today, it remains a very significant find and was, until the excavation of the King Harry Lane Cemetery in St. Albans in 1966-9, one of the largest groups of such vessels known. The Aldbury pots can now be seen again in all their glory, a selection of them are on display at the recently opened Tring Local History Museum in the old cattle market. The pots are on loan from Dacorum Heritage Trust and Berkhamsted District Archaeology Society.